Home >> News >> The project "Infrastructure for ULTRAFAST BROADBAND through PPP" was approved by the Interministerial PPP Commission on 17.01.19. 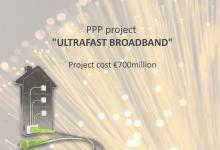 PPP project of total value €700million blending EU Grant with private resources for more than 2.4 million citizen who will be able to connect to the internet at speeds of at least 100Mbps (upgrade to 1Gbps) by developing an extensive fiber optic network as close as possible to the final user. It is a follow on project of the Rural Broadband PPP, which has been awarded by the European Commission as "European Broadband Award 2017".